As we planned for Advent 2018, we were able to get down to the track in the basement, where we will continue with additional building of the layout. It is technically very demanding, so we are proud of the work the guys have done, especially on the elevator with which trains are transmitted on different levels of the layout. But that still was not the biggest attraction of this Advent. A great interest and enthusiasm was caused by a diorama of the King Tomislav Square. Although it was already exhibited last year in the “fall” release, on this occasion we added snow and lots of scenes that evoke the atmosphere of the Advent in this market. 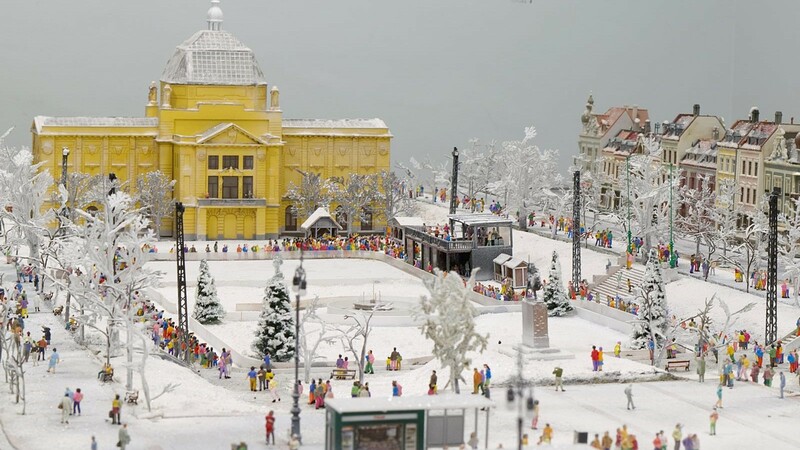 The central part is still a rink with skaters on the move, but the Zagreb’s main railway station was upgraded, to which, thanks to the before mentioned expansion of the railway in the basement, trains were arriving (photos of this part of the model you can see here). Although we were watching the birth of this diorama for months, true knowledge about the beauty of the details have been given only after we watched a video filmed by a young Osijek songwriter Mia Dimšić, which are top masters of their work, conceived and implemented so that Mia is “walking” in our Tomislavac. This masterpiece of video production, you can see here.